Portable modular illumination system for high-speed & ultra high-speed imaging. Portable, Modular Illumination – Ready for Action. 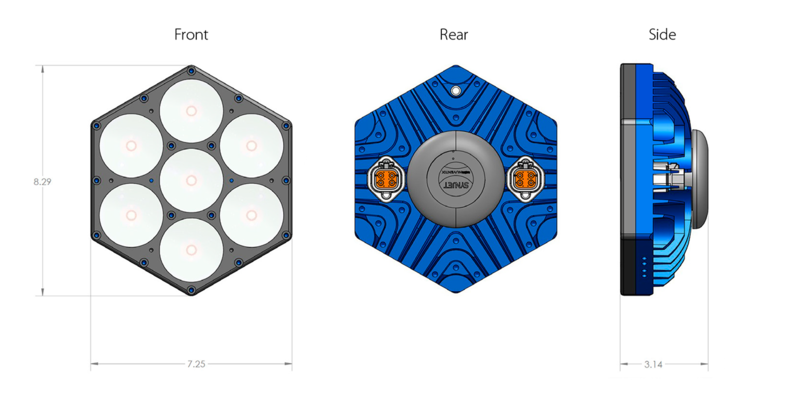 REL SURE-Bright™ Profusion X LED lighting modules with their unique hexagonal design are an integral part of an extremely portable and expandable lighting system. Multiple modules can be combined in a variety of arrays to achieve high-intensity illumination necessary for high-speed & ultra high-speed imaging with a continuous duty cycle. This flexibility enables effective illumination to achieve high-quality digital image correlation with a single camera (2D-DIC) or with multiple cameras (3D-DIC). The luminous output is variable from 0–100% to accommodate exposure, sample reflectivity or lens configurations. Profusion X modules include input/output triggers which can be used to connect and coordinate your testing events. 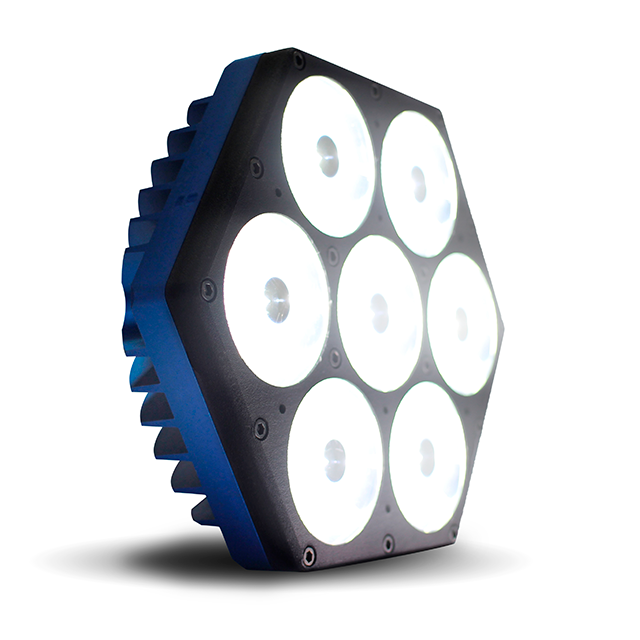 Profusion X LED lighting modules are elegantly designed and precision engineered with seven high-power LED emitters with high-performance lenses. The lens mounting plate allows for focusing light at close and long range distances (2–50 feet). Modules can be mounted on tripods or paired with any camera mounting system*. The high-intensity, high performance continuous light source combined with inherent expandability and focusing, ensures quick setups and consistent image acquisition for all your high-speed imaging needs. * REL SURE-Bright™ Profusion X LED lighting modules are compatible with multi-camera setups from various manufacturers. 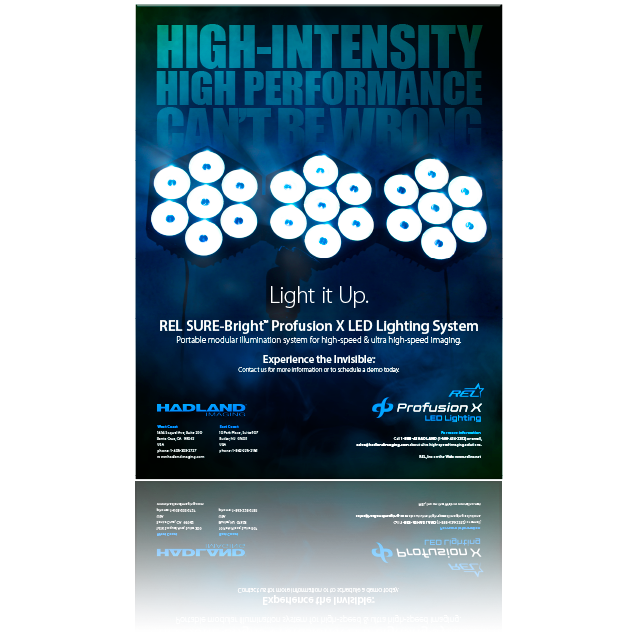 Press the button already or call 1-888-43HADLAND (1-888-434-2352) to get your REL SURE-Bright™ Profusion X LED Lighting System (or at least find out more information). I want my Profusion X!